Help To Heat Scheme - The new Affordable Warmth Scheme? There will be a greater emphasis on fuel poverty which should increase the number of households who qualify for a heating grant. There will be an 18 month transition period from 1st April 2017 to give time to decide the exact details of the new Fuel Poverty Obligation which is due to start in September 2018 and last until 2022. The amount of funding will fall from £870m for the last year of the ECO Scheme to £640m per year in the 18 month transition period. However, parts of ECO will cease and the amount of funding directed to Affordable Warmth and towards alleviating fuel poverty will be increased. The need for an EPC (Energy Performance Certificate) will be removed for applications from householders. The EPC was used to calculate the amount of the grant. The new grant calculation will be based on the carbon saving or cost saving achieved by upgrading the heating system. To simplify this, a deemed score for each applicant will be based on the type of house, how many bedrooms it has, the type of fuel it uses and the proposed energy efficiency measure to be installed. It will be made easier for householders in social housing to qualify for a grant for cavity wall insulation, loft insulation or ‘first time central heating systems, by including social housing with an EPC rating of E, F or G.
The total amount of funding for gas boiler replacement will be capped. 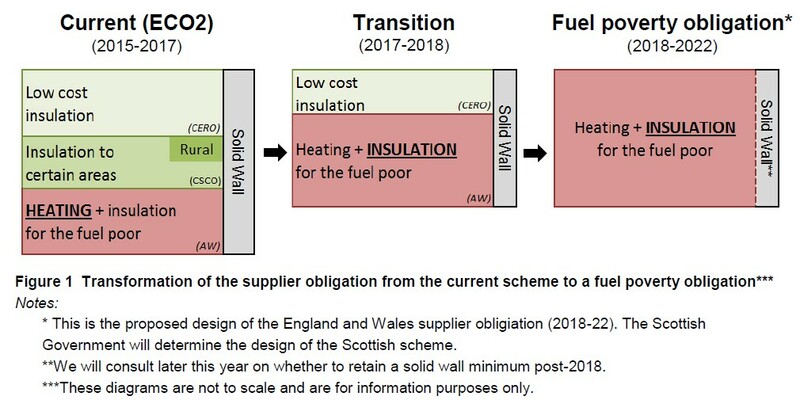 The Help to Heat Scheme will apply to England and Wales but the Scottish Parliament will be able to introduce their own scheme if they wish. Compared to the Affordable Warmth Scheme, Help To Heat introduces changes to the state benefit qualifying criteria. With Pension Credit, only Guaranteed Credit will qualify, those with Savings Credit will not qualify. Also, householders in receipt of Income Support, Income-Based Job Seekers Allowance and Income-Related Employment & Support Allowance will not be required to satisfy further sub-criteria. Rules referring to those qualifying benefits which have an income threshold, such as Child Tax Credit, Working Tax Credit and Universal Credit have been changed to take into account the number of people living in the property. A household on the current income threshold of £16,010 is more likely to suffer from fuel poverty if there are seven or eight people in the household, than if there were just two or three. This applies for tenants in council owned properties and properties which are wholly owned by Housing Associations; shared ownership properties are excluded. Householders who rent social housing will be eligible for a Help To Heat Insulation Grant if their home has an EPC (Energy Performance Certificate) rating of E, F or G.
Grants will also be made available to assist householders in social housing to install central heating systems in homes which have never had central heating installed before. Householders in social housing will not need to also satisfy the state benefit qualifying criteria. Under flexible eligibility for the Help To Heat Scheme, householders who do not fit into either of the two categories above may still qualify if they are considered to suffer from fuel poverty. Local authorities and other appropriate parties may be able to identify and designate households as eligible under Affordable Warmth. Full details of the Affordable Warmth Scheme Qualifying Criteria can be found HERE. Under the deemed score method of calculating a storage heater grant or boiler grant, greater emphasis can be given to particular types of fuel being used by the householder. This will be based on the potential reduction in carbon or the long term cost savings achievable by upgrading a heating system. For example, a higher grant may be awarded to replace heating systems which use electricity, oil, LPG or solid fuel compared to gas. Central Heating Boilers, with any fuel type including gas boilers, oil boilers, LPG boilers and solid fuel boilers. The replacement of gas boilers may be subject to a cap of 25,000 units but boilers using any other fuel will not be capped. First time central heating systems, with any fuel type. This will include the boiler, radiators, pipework and heating controls. Renewable Heating Systems may qualify for the Help to Heat Scheme but where total funding is inadequate, additional funding from the Renewable Heat Incentive may be allowed. The Carbon Emissions Reduction Obligation (CERO) delivered cavity wall insulation and loft insulation measures to any home in Great Britain. The Carbon Saving Community Obligation (CSCO) delivered cavity wall insulation and loft insulation measures restricted to any home within the 25% most deprived areas in Great Britain. Affordable Warmth Group (AWG), described in legislation as the Home Heating Cost Reduction Obligation (HHCRO), delivered heating measures to low income and vulnerable households. It was proposed that the Carbon Saving Community Obligation (CSCO) should end on 31st March 2017 and that Carbon Emissions Reduction Obligation (CERO) will end on 30th September 2018 at the end of the 18 month Help To Heat transition period. This will leave just the Affordable Warmth Scheme to continue as part of the Fuel Poverty Obligation for the four years to 2022. It may however, be referred to as the Help To Heat Scheme. Many lessons have been learned since the ECO Scheme was first introduced in 2013 and although its intentions were good, it could have been much better. ECO set out to reduce the heating bills of vulnerable households whilst cutting their carbon emissions. However, in achieving these goals the easy targets of replacing gas boilers and installing cavity wall and loft insulation were prioritised over the more difficult measures such as replacing oil boilers, LPG boilers and installing solid wall insulation. Also, the definition of vulnerable households was defined by those receiving means tested state benefits but 20% of fuel poor households receive no state benefits at all. The ECO scheme was also burdened with bureaucracy in determining who qualified for assistance and how grants should be calculated and awarded. The new Help To Heat proposals have been designed to direct help to those suffering from fuel poverty, reduce some of the bureaucracy and concentrate more on replacing faulty and inefficient heating systems. This will make a real difference to carbon reduction and long term cost savings rather than those which are the easiest to upgrade. The Help To Heat Scheme will be tested during the 18 month transition period from 1st April 2017 but the real test will be the effectiveness of the new Fuel Poverty Obligation which is intended to run from September 2018 to 2022. The Energy Company Obligation (ECO) was introduced to deliver energy efficiency measures to homes in Great Britain in order to help households cut their heating bills and to reduce carbon emissions. ECO was launched in January 2013 and is due to end on 31st March 2017. The Government’s Spending Review 2015 announced plans for a new supplier obligation, the Fuel Poverty Obligation, to run for five years from April 2017 with funding of £640 million per year. This consultation relates to a proposed transition period of 18 months from April 2017, followed by the longer term scheme for the remaining four years. The Government believes that the best long term solution to tackling fuel poverty is to make it easier for householders to heat their homes, by improving energy efficiency. Supplier obligations such as ECO have done this for over twenty years but some households which received financial assistance may have been able to afford such improvements themselves. The Government therefore wants to focus help more to those who need it most, the fuel poor and vulnerable households. A series of reforms are therefore proposed to simplify the scheme, make it more cost-effective and target it more to those suffering from fuel poverty. Although the overall cost will fall from £870m to £640m per year, the element focusing on fuel poverty will rise from £310m to £450m. The Help To Heat Scheme will result in one million warmer homes over the course of this Parliament. The Government feels that the best way to introduce the changes is with a transition period to smooth the move from ECO to the Fuel Poverty Obligation. The Government is committed to helping households with the lowest incomes and highest energy costs to keep their homes warm. Living in a cold home can affect health, social mobility, educational attainment and life chances. Improving energy efficiency for these households is the best long term solution to keeping warm and dealing with fuel poverty. A household is considered to be suffering from fuel poverty in England if the home has higher than typical heating bills and after paying these bills is left with a residual income below the official poverty line. According to the latest official statistics there are approximately 2.3 million households suffering from fuel poverty in England. Since ECO started in 2013 the Government has been analysing how it contributed to alleviating fuel poverty in order to better design future policies. Consideration was given to how ECO helps households on the lowest incomes but the Affordable Warmth Scheme, the part of ECO which focuses on dealing with fuel poverty, only accounts for one third of total ECO funding. The Hills review concluded that supplier obligations are effective at addressing fuel poverty and suggested that under Help To Heat, a greater proportion of ECO funding be directed towards Affordable Warmth. At the same time, the Affordable Warmth Obligation should be improved to better focus on dealing with fuel poverty. This can be achieved by changing household eligibility criteria and by directing funding to measures which are the most effective in helping the least energy efficient homes. These measures include insulation and installing a central heating system in homes which do not have one. The ECO Scheme set targets for energy suppliers to achieve by 31st March 2017. The proposal is to extend ECO through the Help To Heat Scheme, to 30th September 2018 with a greater focus on fuel poverty and to use this as a platform on which to design the long term Fuel Poverty Scheme which will run for four years after that. Extending the current supplier obligation is designed to smooth the transition from current ECO arrangements to an obligation more focused on fuel poverty. Staggering the changes will give energy suppliers and companies involved in delivering the energy efficiency measures more time to adapt to the changes. 1.Carbon Emissions Reduction Obligation (CERO) delivered insulation measures to any home in Great Britain. CERO will continue during the transition period to enable cost effective delivery of the Government’s commitment to insulate one million homes during this Parliament. 2. Carbon Saving Community Obligation (CSCO) delivered insulation measures to homes in the 25% most deprives areas on Great Britain, 15% of which were delivered to rural areas. It is proposed that CSCO will end on 31st March 2017 because it is more expensive to deliver than CERO and HHCRO is better at targeting the fuel poor. 3. Affordable Warmth (referred to in legislation as the Home Heating Cost Reduction Obligation, HHCRO) delivers heating measures to low income and vulnerable households. HHCRO long term savings targets are to be increased by 50% during the transition year, after which it will be the sole focus of the Supplier Obligation in England and Wales. The Government proposes to re-balance the obligations with a greater focus on Affordable Warmth, via the Help To Heat Scheme. 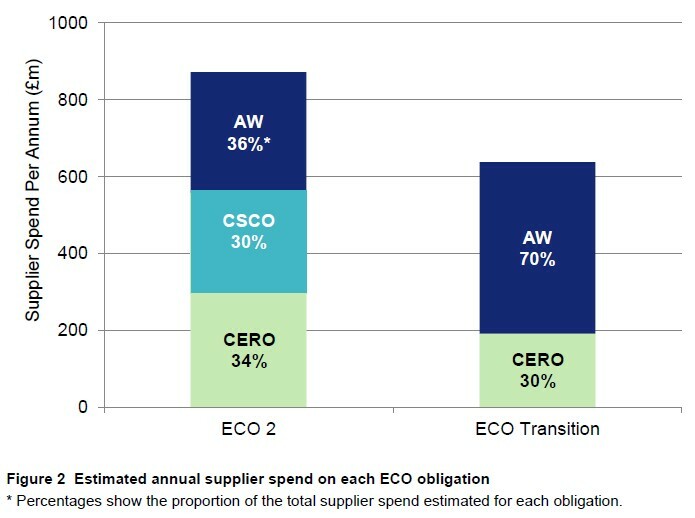 The illustration below shows that although overall ECO spend will fall in the transition year, the proportion directed to Affordable Warmth will increase. It is proposed to improve the Affordable Warmth Scheme’s effectiveness at alleviating fuel poverty by simplifying household eligibility criteria. To increase the total number of eligible households from 3 million to 4 million. To increase the number of fuel poor households which are eligible for support, which in the case of England will be a 60% increase to over 1.1 million homes. To provide support to fuel poor and vulnerable householders who would not otherwise be eligible. Although around 4 million households will be eligible for support in the transition period, the Government estimates that 160,000 will receive help under Affordable Warmth in 2017/18. Up to 31st March 2017 the Affordable Warmth Scheme only provided for homeowners and privately rented households who received certain state benefits. With regard to tax credits this also had an income threshold. However, under the old criteria around two thirds of all fuel poor households in England were excluded. 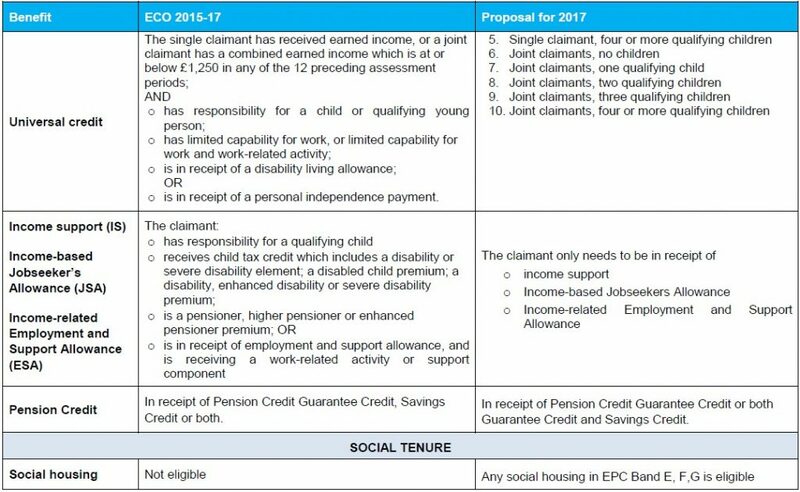 To introduce income thresholds for Universal Credit and tax credits which take into account the composition of the household. High occupancy households are more likely to suffer from fuel poverty on the current income threshold of £16,010 than low occupancy homes. It is proposed to have ten income thresholds based on a single person or a couple and whether they have 1, 2, 3 or 4+ dependent children. To simplify eligibility criteria for other benefits by ensuring that an applicant only needs to receive the benefit and does not have to satisfy additional qualifying criteria such as disability or parental responsibility for a child. To remove Pension Credit Savings Credit from eligibility criteria. To include social housing with an EPC rating of E, F or G for insulation grants and first time central heating systems. To introduce flexible criteria for fuel poor homes which do not satisfy the above criteria. The electronic verification system already in place with the Department for Work and Pensions (DWP) will be adapted to reflect these changes. 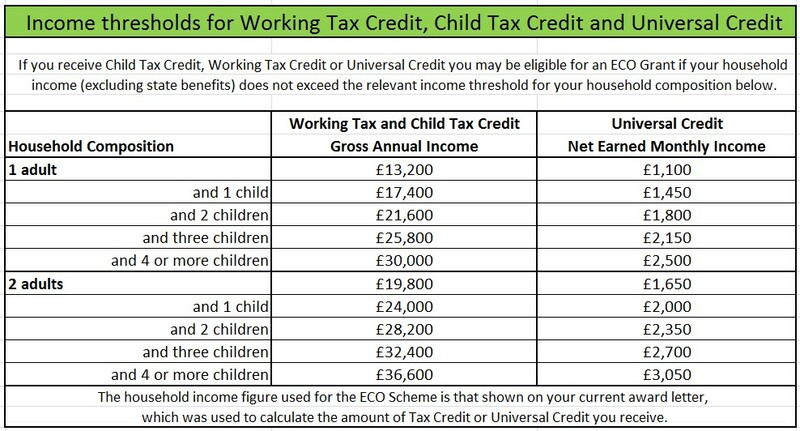 Applicants in receipt of Child Tax Credit, Working Tax Credit or Universal Credit will qualify for support under the Help To Heat Scheme if their household income is below a threshold based on their household composition. This is a change from ECO2 which only had one income threshold regardless of how many people live in the property. It also means that for the first time, some households without children who failed to meet ECO2 qualifying criteria may now satisfy Help To Heat qualifying criteria. Householders in social housing have previously not been eligible for support under Affordable Warmth due in part to the relatively high proportion of funding received under ECO’s predecessors. However, people living in social housing tend to have lower incomes than those in other housing groups and are therefore more likely to suffer from fuel poverty. With Help To Heat the Government proposes to include social housing with an EPC rating of E, F or G in the Affordable Warmth scheme. Crucially, such householders will not have to satisfy further criteria with regard to income levels or state benefits. Although the new Help to Heat proposals are designed to focus more on alleviating fuel poverty than ECO2 did, there are still a significant proportion of homes suffering from fuel poverty which would not be eligible for support under the new rules. The Government therefore proposes to allow local authorities and other organisations to identify and propose households for support under the Affordable Warmth scheme. Social housing will be excluded from flexible eligibility because those with the least energy efficient homes will be included anyway. Low income households which are vulnerable to the effects of living in an inadequately heated home. The energy efficiency measures which attracted support under ECO2 will continue to be funded during the transition year but may be restricted to ensure that the strategic objective of tackling fuel poverty is more closely followed. The replacement of gas boilers has dominated ECO2 to the expense of other measures so an annual limit of 25,000 gas boiler replacements is proposed for the transition year. Qualifying non-gas boiler replacements such as oil, LPG or solid fuel will be supported with a greater level of funding than gas boilers and with no upper limit. Electric storage heaters, again with no upper limit on support. First time central heating systems will be supported for households without one. Again there will be no upper limit as this type of household is twice as likely to suffer from fuel poverty than the average household. Heating controls for any fuel type. Since January 2013 over 1.4 million homes have benefited from improved energy efficiency measures under ECO. However, both the Government and the supply chain feel that the level of administration has added considerably to costs of delivering these measures. The Government therefore proposes to simplify ECO during the transition period and beyond into the longer term scheme. Removing CSCO and its rural sub-obligation. Removing the requirement for a Green Deal Advice Report for CERO measures. Introducing ‘deemed scores’ for Affordable Warmth rather than calculating individual ECO scores. With regard to Affordable Warmth, the most significant change in the proposals is to use deemed scores. During ECO1 and ECO2 each home required a detailed assessment to calculate its individual ECO score based on the anticipated carbon saving or bill saving achievable over the proposed measure’s lifetime. This required an EPC and SAP assessment which is both costly and time consuming. Installers do not know the commercial value of a measure until after this assessment and may choose to withdraw from the installation. This reduced the scheme’s cost-effectiveness and frustrated applicants, who though they satisfied eligibility criteria did not receive the energy efficiency measure. The Government proposal of deemed scores would entail the production of a fixed set of scores based on property type, number of bedrooms, heating type and the measure proposed. This will greatly simplify and speed up the process whilst reducing cost. It could also incentivise the delivery of energy efficiency measures to homes where they have the greatest impact. The 18 month transition period starting on 1st April 2017 will pave the way for a brand new, fuel poverty focused obligation to run from September 2018 to March 2022. Phased changes in the transition years include those to householder eligibility, energy efficiency measures and administrative requirements. It is proposed that the new obligation should be a natural progression from the transition period. The Government intends to publish a full consultation on the fuel poverty obligation early in 2017. Help To Heat - The New Affordable Warmth Scheme?